We had a busy Memorial Day weekend. Ben flew in from Washington with his girlfriend, Bonnie, so we could meet her… and so he could introduce her to Central Florida in one long weekend! On Friday, we went to Sea World and found out Bonnie had never been before and had never been to an aquarium or on a roller coaster or on a flume ride, so we took care of that. We made sure to take her to our favorites: the Kraken rollercoaster, Journey to Atlantis, Wild Arctic, Jewel of the Sea Aquarium, Stingray Lagoon, Dolphin Cove, Penguin Encounter, Shark Encounter, Manta Aquarium, Pacific Point Preserve, and the Blue Horizons show. We didn’t know the park was closing early, otherwise, I’m sure Ben and Josh would have taken Bonnie on the Manta rollercoaster and we would have taken her to A’Lure, an acrobatic show. We had a barbecue dinner at the Voyager’s Smokehouse. Sunday, we went to church and then stayed around home for a yummy dinner and belated birthday party for Ben. He turned 25 this year! He loves to make cakes, so he actually made his own birthday cake, a Black Forest Cake. See tomorrow’s post for news about the rest of our big weekend, a video of barnacles, and a link to a photo slideshow about our weekend visiting St. Augustine, the beach nearby, and Campus Crusade for Christ headquarters. Or just click here for a slide show with pictures from our fun-filled family mini-vacation. Want more ideas about visiting Central Florida? 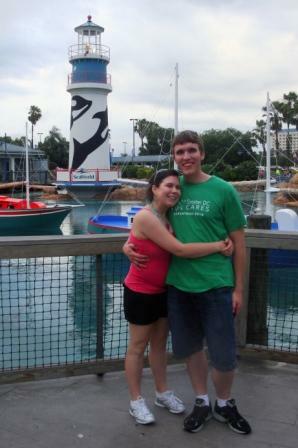 See older posts on St. Augustine, Gainesville, and Sea World. This post is part of the series of recommended tips for enjoying I-95. I didn’t know there was so much to do in the Tampa vicinity…Now I’ll know where to check/ or who to check with , when I come to that area next. All I did last trip there, was stay at a small beachside motel…visit my 93 yr. old uncle in Seminole, eat outside…eat somewhere else…and no sightseeing. You p0acked a lot of places into a short weekend!!!! I’ll be glad to give you some tips when you come again or just click on tags in the “Tag Cloud” to the right. For instance, I have not been to Tarpon Springs yet. It’s a Greek sponge-fishing community. That would be fun, but this oil spill will be hard on them, unfortunately!